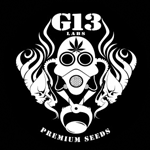 G13 Labs - White Widow. Free US delivery. The White Widow is one of the most, if not the most famous, names in the world of cannabis seeds strains. While this is partly due to her memorable name, speed, yield and stunningly ultra-thick resin coating have a lot more to do with it! A Mostly-Indica strain, with sweet, strong, acrid smoke that imparts a hammering stone.